April is tax season. If you haven’t yet filed, here are our tips on how to maximize your deduction, file an extension, and finish those taxes. April 15 is Tax Day, but in 2018, April 17th is the deadline for most taxpayers to file an extension and to pay taxes owedExternal Website to avoid penalty and interest charges. If you file for an extension, your return is due October 15, 2018. If you are going to miss the deadline, file an extension on IRS.govExternal Website, the website for the Internal Revenue Service. It’s free to file for an extension. Taxpayers who owe tax, and failed to file and pay on time, will most likely owe interest and penalties on the tax they pay late. To keep interest and penalties to a minimum, taxpayers should file their tax return and pay any tax owed as soon as possible. There are two penalties that may apply if you do not file on time or file for an extension and if you do not pay on time. Just because you file an extension does not mean that you don’t have to pay any taxes owed as of April 17, 2018. The penalty is generally 0.5 percent of taxpayers’ unpaid taxes per month. It can build up to as much as 25 percent of their unpaid taxes. It’s free to print off tax forms and prepare your own taxes. This works best for people with simple tax situations and a natural proclivity toward budgeting and math. If you don’t have a good handle on your finances, this may not be the right choice for you. Tax software walks you through your income and deductions. This costs less than using an accountant but still requires a significant investment of your time if your circumstances are complex. 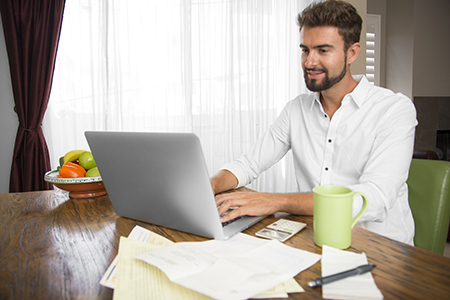 A trusted tax professional can do your taxes and maximize your deductions. If your tax situation is complicated, this may be your best bet. While this is the priciest way of getting your taxes done, skilled tax professionals often pay for themselves. If you are able, file by the deadline to lower your tax liability, avoid penalties and interest, and get your refund faster. If you have three or more kids, you can claim as much as $6,242 with the Earned Income Tax Credit, for instance. You may be able to deduct up to $4,000 per dependent. If you care for an elderly parent, support an out-of-work partner, or raise kids, it will lower your taxable income. One caveat about child tax credits: If you earn more than $75,000 as a single parent ($110,000 for a married couple filing jointly), you may be ineligible for these credits. Lower your tax liability and fund your future by contributing to an IRA account. Individuals under 50 can deposit $5,500 in their account, while those over 50 can save $6,500. Not only does contributing to your IRA lower your tax liability, you may receive a saver’s credit of $1,000 individually or $2,000 jointly. Once you’ve taken care of your taxes for the year, why not review your financial portfolio to see how you can better prepare for next year by increasing your refund or saving for taxes owed?